A Fort Lee soldier caught in the bureaucratic limbo of the Pentagon’s new “extreme vetting” for non-citizen service members has died while waiting for the military to clear him for duty, Military Times has learned. Spc. Nemanja “Yani” Janicijevic, 25, died April 12 during a physical fitness training session at Fort Lee, Virginia, installation officials said in a statement. He had been stuck at Fort Lee for 11 months after his graduation from advanced individual training, up to the day of his death. Janicijevic, who was from Belgrade, Serbia, entered the military under the Military Accessions Vital to the National Interest program, or MAVNI, and was trained as a diagnostic equipment support specialist with the 832nd Ordnance Battalion, 59th Ordnance Brigade. MAVNI is a pilot program that helps the military fill critical capability gaps such as foreign languages or medical skills by allowing non-U.S. citizens with those skills to enlist and earn citizenship. Janicijevic completed basic training, then arrived at Fort Lee for advanced individual training in August 2016. Just months after Janicijevic began AIT at Fort Lee, however, the MAVNI program was suspended, leaving him and others like him in limbo. No new MAVNI recruits were accepted. Janicijevic became a “holdover” — a recruit who was essentially frozen in the process. As Janicijevic waited, suspicion over foreign-born recruits took hold within the Pentagon’s administrative ranks, despite generations of immigrant soldiers who have fought, died and become highly decorated members of the U.S. military, said retired Army Lt. Col. Margaret Stock, who now specializes in military immigration legal issues. “DoD has officially made all of the MAVNIs into second-class citizens who have been labeled ‘security threats’ because of their foreign birth,” Stock said. These additional barriers to entry for immigrant soldiers have come at a time when the military has had to push back on reports that it is lowering entrance standards, due to the difficulty in finding young people who meet the military’s physical fitness and aptitude tests — and who are willing to serve. Additionally, as many as 13 or 14 percent of those already serving have not been deployable for fitness, health or other reasons. Janicijevic was on his 336th day of waiting to be vetted when he died. In 2017, Defense Secretary Jim Mattis said he wanted to save the MAVNI program, and announced new vetting procedures for foreign-born recruits. But those additional checks have, in some cases, created so many delays that potential soldiers may have to leave the process because of expiring visas or other reasons. Janicijevic was beloved at Fort Lee and like a big brother to many of the younger soldiers he trained with, said Spc. Christopher Campbell, 21, who was at Fort Lee at the same time as Janicijevic. Janicijevic was selected as their platoon guide at Fort Lee, said Spc. Carter Wagner, 22. Campbell and Janicijevic volunteered together off post at a local school, reading books to kids and handing out hot dogs and snacks, Campbell said. Janicijevic also helped him train to improve his run times on the Army’s PT tests. Campbell graduated from advanced individual training in late November 2016 and was sent to Korea. When Janicijevic graduated from advanced individual training in May 2017, he was left behind at Fort Lee. Because of the programmatic limbo, Janicijevic was unable to move on to his duty station. Janicijevic’s duty station was going to be in Germany. “He was really excited about it,” Campbell said. Fort Lee spokeswoman Dani Johnson said the cause of Janicijevic’s death is under investigation. “It is always hard to lose a part of our military family. Our thoughts and prayers are with Specialist Janicijevic’s family and friends during this very difficult time,” Johnson said. 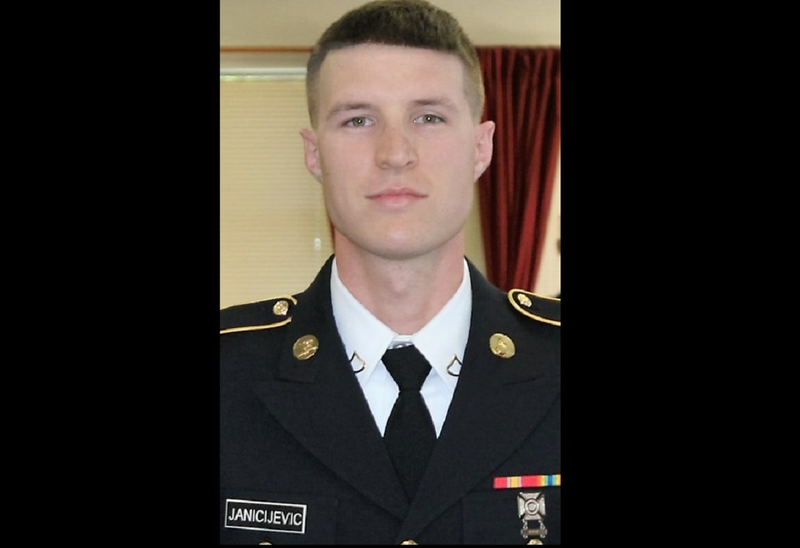 Because of his completed service at the time of his passing, Janicijevic earned full military death benefits, including a military burial if his family chooses, and military life insurance payout, said Army Maj. David Eastburn, a Pentagon spokesman. Stock said the Pentagon has neither the manpower nor the interest in processing holdover recruits — soldiers like Janicijevic who are stuck in the program’s bureaucracy. Eastburn would not say how many MAVNI service members are still waiting to clear all of the security checks. Both Campbell and Wagner expressed their surprise that Janicijevic hadn’t been able to move on. Janicijevic was posthumously promoted to the rank of specialist, the Army said.